It’s a bong! It’s a vape! It’s a… bape? A vong? I dunno, man, but the Hydrology 9 produces the smoothest vapor I’ve ever tasted. 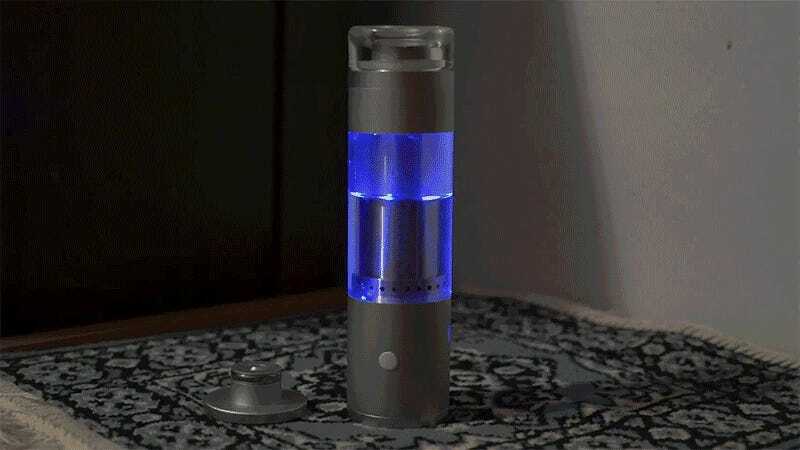 The Hydrology 9 is the first portable “liquid filtration vaporizer.” It’s roughly the size and shape of a Red Bull can, but two inches taller. The combination of brushed aluminum and glass gives it a handsome, sophisticated look. Honestly, looks like something a stoned Jony Ive would make, if he wanted to make a lightsaber to smoke weed out of. 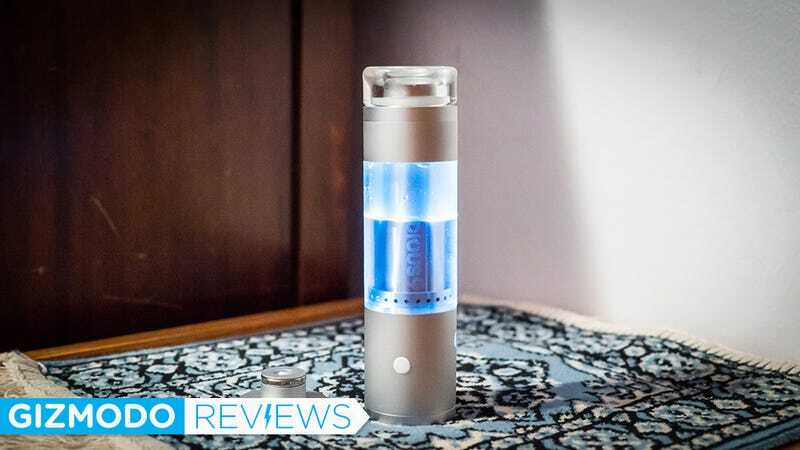 As much as we hate the term “frankengadget” that’s sort of what this thing is, as it brings the the advantages of a bong (sorry, “waterpipe”) to the world of vaporizers. The concept of the bong—for those of you who who didn’t live in my dorm—is that the smoke passes through some water, with the primary objective being to cool the smoke down. The water does a little filtering, too. The combination makes for a smoother, less harsh hit. Vaporizing weed (which heats the bud to the point where the good stuff turns to vapor, but the nasty stuff doesn’t burn) is already way easier on your throat and lungs. Adding bong filtration makes the heat even lower, the vapor a little less dry, and everything feel incredibly smooth. The Hyrdology 9 is chock full of smart features. At first glance I thought, “There’s no way this thing is going to be ‘portable’ once it’s filled with nasty bong water.” I was wrong. The mouthpiece has a built-in valve to make it essentially leak-proof, especially when you attach the magnetic mouthpiece cover on top of it. I tried knocking it over, flipping it, and running around with it in a backpack, and I was amazed to find that it didn’t spill a drop. To use the vaporizer, you unscrew the mouthpiece and pour some water in until it’s roughly 70 percent full, then reattach the mouthpiece. Turn it over and unscrew the bottom compartment. That’s where you put your ground-up herb. The bowl looks small, but it’s actually very deep, which makes it pretty big for a portable vape (0.7 x 0.4 inches), and it has a clever, built-in stirrer so you can get even heating throughout your session without having to open up the chamber. You just twist the bottom piece and you’re good to go. As you exhale you realize you took a way bigger hit than you intended. The vapor this thing produces is so smooth you can barely feel it entering your lungs or throat. There is none of the dryness or heat I get with even the best vaporizers, even when I set the Hydrology to the highest temperature. Before you realize it, you are way more stoned than you intended to be, so I hope you don’t have anything important to do. Actually, that’s a byproduct of one of my problems with the Hydrology 9. Its five heat settings—blue, light green, orange, purple, and red — correspond to 392F, 410F, 428F, 446F and 464F, respectively (or 200C, 210C, 220C, 230C and 240C, if you’re playing the Celsius game). 392F is really high to be the lowest setting. The Vapium Summit, for example, starts at 320 degrees F (160C). The G Pen Elite can go as low as 200 degrees. I generally like my vaping sessions around 372F, which the Hydrology 9 can’t do. For those who are new to this, different cannabinoids vaporize at different temperatures. So if you’re vaping cooler, you will get a lighter vapor, but you’ll be leaving some of the good stuff in the bud. If you vape it hotter, then you get more of the good stuff, but you start getting more of carcinogens, too. It’s all about finding that balance point. The water filtration here lets you vape it a bit hotter without getting the smokier taste. Getting too stoned isn’t the end of the world, but my biggest gripe might be a deal breaker for some: The Hydrology 9 is right on the upper edge of what could be reasonably called “portable.” At seven inches long and 1.75 inches in diameter, it’s certainly not going to fit into your jeans pocket. At least not without looking… odd. When I’m looking for a portable vape I’m thinking about something I can throw in a pocket and take on a hike. You’re going to need a backpack or purse for this thing. It feels more like a vape you keep at home but you don’t have to keep plugged in. Other small gripes? It takes about a minute for it to get up to temp, which is pretty slow. Occasionally, when you’re taking a long draw, a bubble will come up and splash your lip with bong water. Now, it’s vape-bong water, so it’s not nearly as nasty as standard bong water, but it certainly isn’t ideal. Cloudious 9 (the company that makes this thing) claims that it will last roughly 15 session on a single charge. I guess that depends on what you call a session. I found that I got closer to ten. It certainly isn’t bad, but it’s not a marathoner, either. Ultimately, the quality of the vapor this thing puts out is just so damn good that it’s impossible not to love it. The sleek and smart design helps, too. I just wish it weren’t so damn big. It costs $250, but your throat, lungs, and taste buds will thank you. You can also buy a leather carrying case for $50 if you’re worried about the glass shattering in your purse.